NOTE: This edition has a linked "Table of Contents" and has been beautifully formatted (searchable and interlinked) to work on your Amazon e-book reader or iPod e-book reader. Following Anne of Green Gables (1908), the book covers the second chapter in the life of Anne Shirley. 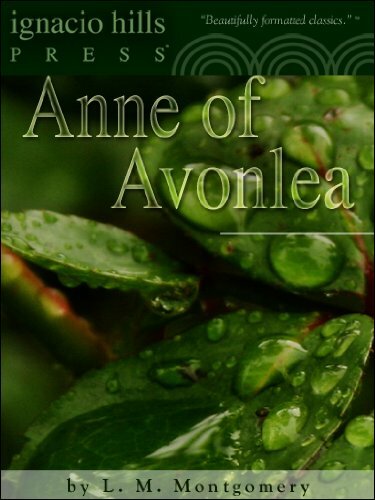 This book follows Anne from the age of 16 to 18, during the two years that she teaches at Avonlea school. It includes many of the characters from Anne of Green Gables, as well as new ones like Mr. Harrison, Miss Lavendar Lewis, Paul Irving, and the twins Dora and Davy. The book starts by revealing that Anne is to be the teacher of the Avonlea School, although she will still continue her studies at home with Gilbert, who is teaching at the nearby White Sands School. The book soon introduces Anne's new and problematic neighbor, Mr. Harrison and his obscene parrot, as well as the twins, Davy and Dora. Other characters introduced are some of Anne's new pupils, such as Paul Irving, an American boy living with his grandma in Avonlea. A wonderful, well-written thrilling and vigorous novel. A must-have for classic romance fans!